Michigan is looking for help to review controversial changes to proposed social studies standards. But if you want to volunteer, do it quickly: the deadline is Wednesday. The education department is looking for a task force of about 100 people, divided into six subgroups for different grade ranges and topics, as well as a bias review team. Each subcommittee will be chaired by two of the original social studies authors to maintain continuity in the process, according to an MDE news release. Michigan residents have until Wednesday to complete an online application. Then, the education department will select task force members based on educational background, teaching experience, ethnic/cultural diversity, and geographic diversity. In addition to social studies educators, school administrators and academicians, the task force will include students, teachers, parents, and community members. The task force will weigh feedback the department received in public hearings over the past five months and in more than 4,000 online comments on proposed social studies standards. The goal of the department is to have changes to the proposed standards completed by the end of the year. Bridge Magazine first revealed the proposed revisions in June, advanced by conservative newcomers to a focus group discussing revisions. The proposals quickly garnered national attention. Michigan’s social studies standards were last changed in 2007. The education department has been working to revise them for four years. Who made these changes and under what authority? The State Board is lawfully empowered to establish these kinds of guidelines. 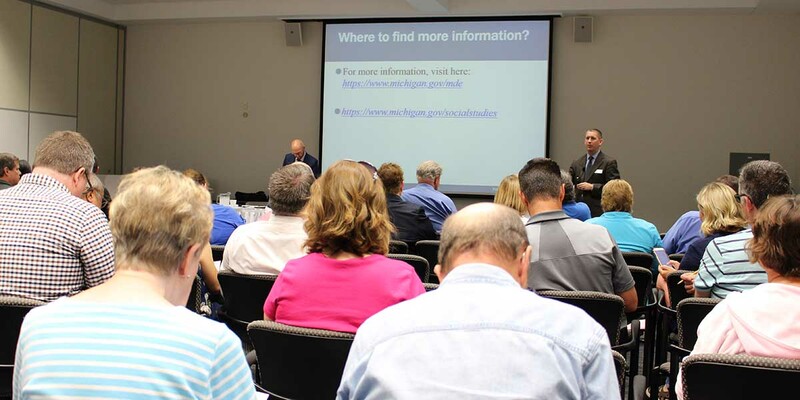 They are expected to use reasonable efforts to review and improve their guidelines, and that is what they have tried to do with a past series of public meetings and input-gathering. There is a wide spectrum of opinion in our state about this issue, so it should be of no surprise that there is some controversy about where these hearings may be leading. I don't know that there is any surefire way of bringing everyone together on the issue. I just hope that they do the best that they can do. Thanks for publishing this important story. I read the Detroit Free Press every day, but totally missed any mention that the State Department of Education was taking a second (or is this a third or fourth) look at this issue. As a result, I've signed-up as a possible participant, but it is always difficult to organize this kind of review and to get a credible array of input. Kudos, then not only to you, but to the State Board as well. Where did these focus groups meet? How were they selected? Was there representation from the Hispanic and African American communities?